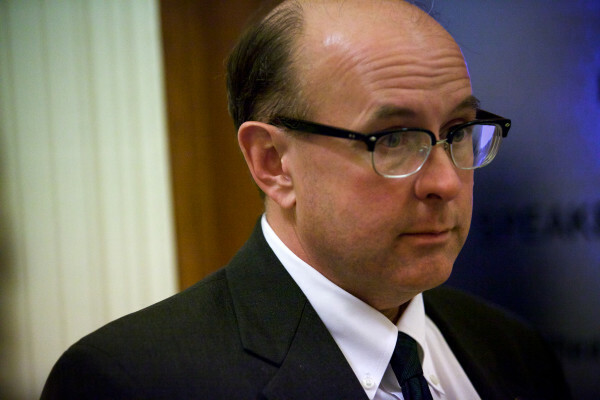 Maine Secretary of State Matt Dunlap. AUGUSTA, Maine — A group of Mainers attempting to establish an official Libertarian Party here has sued the secretary of state’s office, claiming that Maine’s rules for establishing a political party are unconstitutional and that there is not an adequate process for appealing decisions by the state. The suit centers on failed efforts last year by the Libertarian Party of Maine Inc., a nonprofit organization based in Brunswick, to become the fourth recognized political party in Maine. It alleges that Maine law violates First and 14th Amendment constitutional rights. Filed Jan. 4 in U.S. District Court by Portland-based attorney John Branson, the suit names as defendants Secretary of State Matthew Dunlap, Deputy Secretary of State Julie Flynn and Assistant Director of Elections Tracy Willett, all in their official capacities. The Libertarian organization spent most of 2015 trying to provisionally enroll at least 5,000 Maine voters prior to Dec. 1, as Maine law requires for establishment of a new political party. The organization claims it submitted names of 6,482 Libertarian Party enrollees representing 356 Maine towns and cities, but the secretary of state’s office ruled on Dec. 8, 2015, that only 4,489 of them could be verified in Maine’s voter database as registered Maine voters. On Dec. 14, 2015, the organization requested an extension of the five-day verification deadline so what it called “the extraordinarily high rejection/failure rate” of the enrollment submissions could be investigated. According to the lawsuit, the state double-checked some of the enrollees in larger municipalities, resulting in the discovery of newly validated voters. After that, the revised total was 4,513 — still far short of the threshold of 5,000. As a result, Flynn unenrolled all of the Libertarians from the party, essentially making them independents. Branson said his clients are continuing to enroll voters in anticipation of the court granting a temporary injunction — which Branson said he’ll file for by next week — that restores the voters’ status as Libertarians. The rejection of the organization’s efforts is significant because it bars Maine Libertarians from participating in the primary election process by nominating, voting for or otherwise supporting Libertarian Party candidates at the federal, state or local level. It also barred any Maine citizen from running as a Libertarian. Branson said he and his clients see the law as an example of how Democrats and Republicans conspire to thwart the formation of additional political parties. Jorge Maderal of Brunswick, chairman of the Libertarian Party of Maine Inc., said his organization relies on donations and spent several thousand dollars paying for the enrollments. He said he’s been working on establishing the Libertarian Party in Maine since 2010 when he left the Navy.